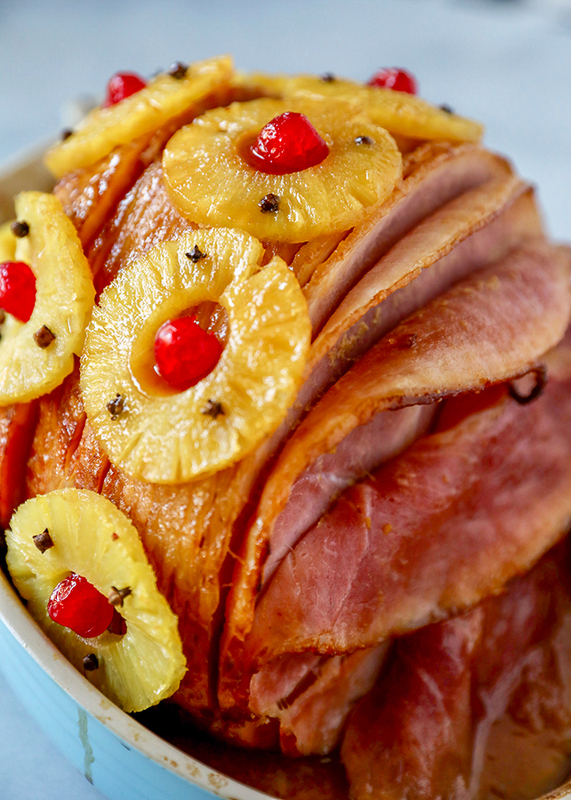 This Old-Fashioned Holiday Ham is the perfect Baked Ham Recipe. 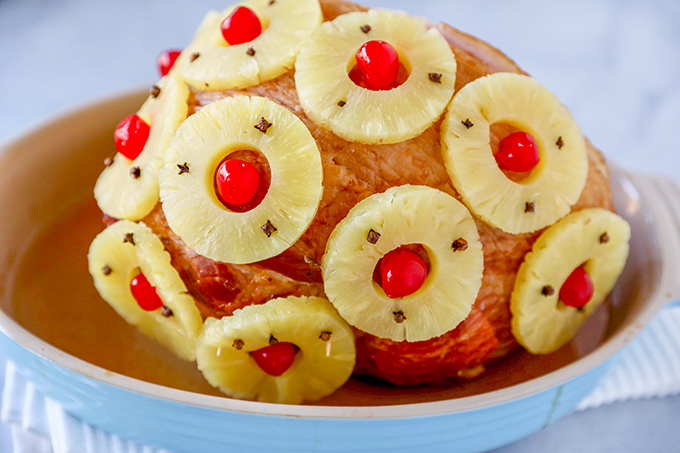 Spiral sliced ham glazed with brown sugar and pineapple juice, and decorated with colorful pineapple slices and cherries. 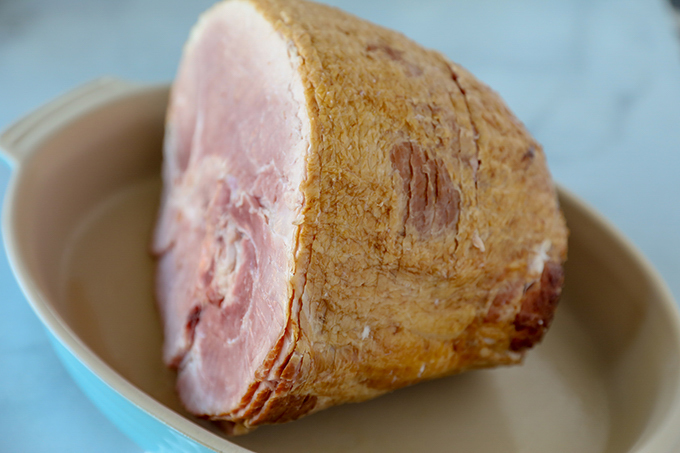 You won’t believe how easy this baked ham recipe is to make! 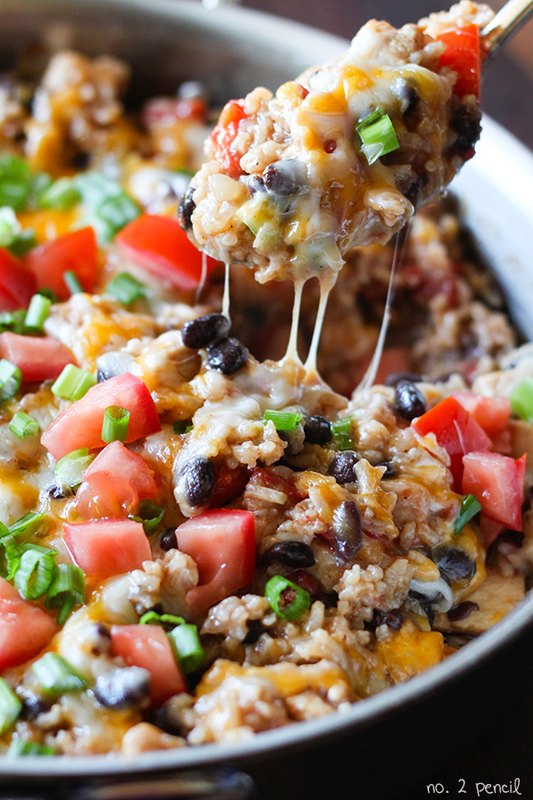 It’s as delicious as it is festive, and it’s perfect for the center of your holiday table. Start with a store bought spiral sliced ham. Spiral sliced hams are already fully cooked, but need to be flavored and warmed without drying out the ham. For the recipe, discard the seasoning package that comes with the ham. 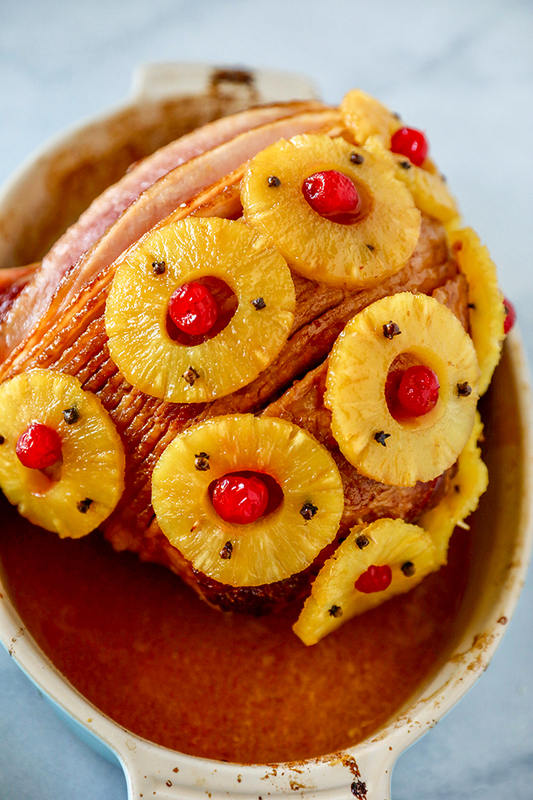 We will be making our own delicious homemade ham glaze! 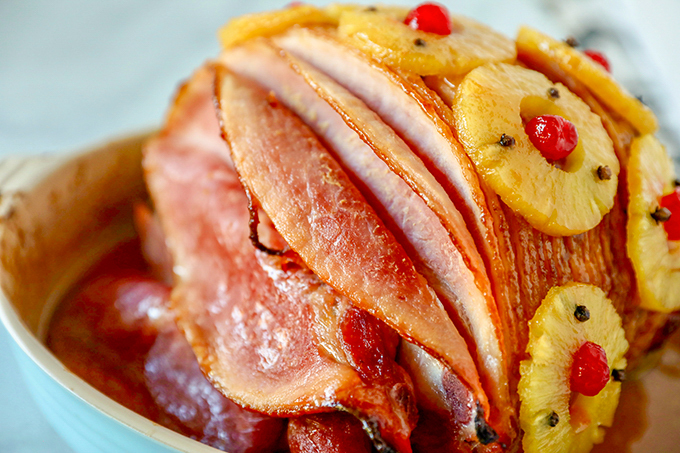 Wrap the ham tightly in foil and follow the package instructions for heating the ham. 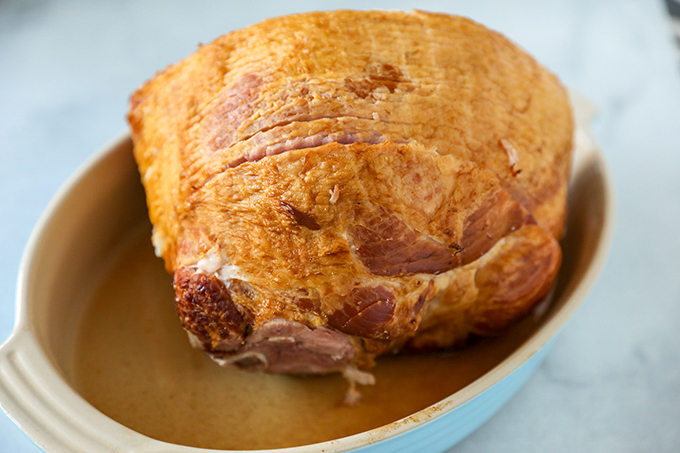 Once the ham is heated through, remove foil covering and prepare glaze. I like to use whole cloves when I can to secure the decorative pineapples and use toothpick for the trickier areas. 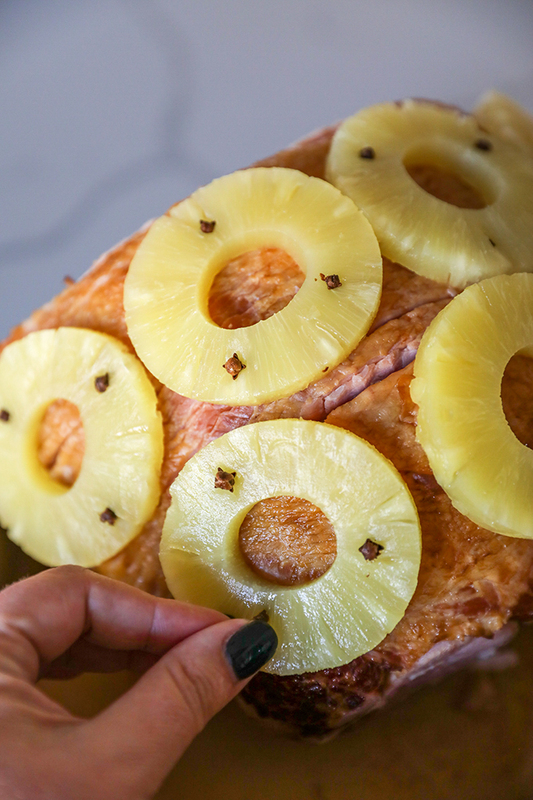 Use the longer pointed end of the whole cloves and press them into the pineapple until it is secured to the ham. 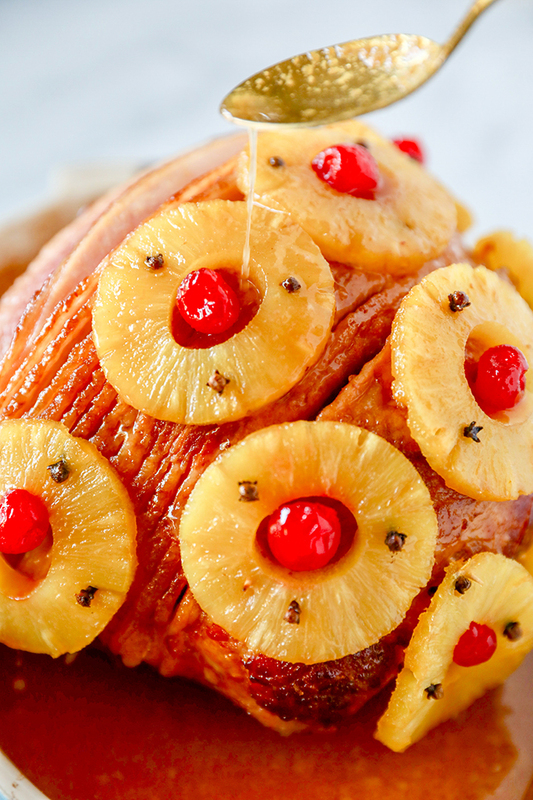 Use toothpicks for the cherries and for the pineapple slices on the sides of the ham. Combine brown sugar, mustard and pineapple juice as needed to make a thick glaze. Then get busy spooning the glaze all over and in between the spiral ham slices. Bake for another 30 minutes, then remove from oven. Spoon extra juices back in between slices. Slice and serve, making sure to remove toothpicks before slicing. 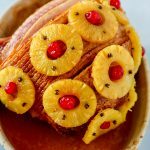 Baked Ham Recipe with a Pineapple Brown Sugar glaze, perfect for the holidays. 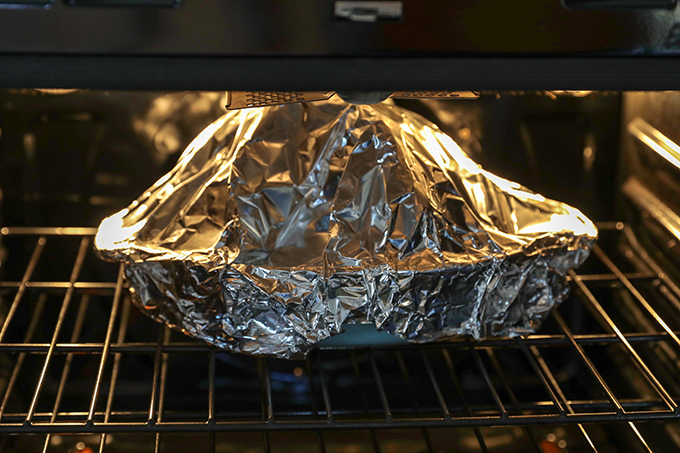 Place ham in baking dish, discard seasoning package and cover tightly with foil. Heat ham according to package directions, removing about 30 minutes before fully heated. Remove ham from oven and remove foil from ham. 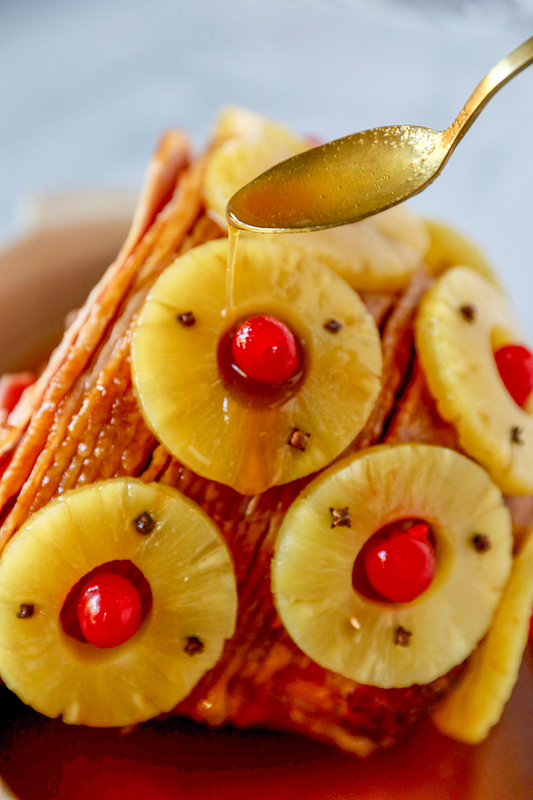 Use whole cloves and toothpicks to secure pineapple slices to ham, use toothpicks to secure cherries to center of each pineapple ring. In a small bowl, combine brown sugar, mustard and enough pineapple juice to make a thick glaze. Spoon glaze over ham and in between slices. Bake uncovered for another 30 minutes. 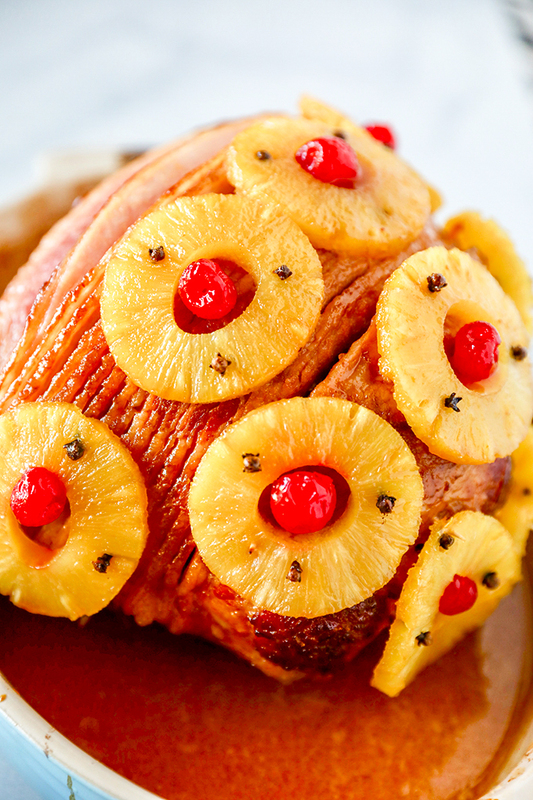 Remove ham from oven and spoon liquids over ham and in between slices before serving.